The vision of a seaway can be traced back to 1895 when the joint U.S.-Canadian Deep Waterways Commission was formed to study the feasibility of building such a waterway. Historical accounts say that was followed by an International Joint Commission study in 1909, but no action was taken. By 1900, a complete network of shallow draft canals allowed uninterrupted navigation from Lake Superior to Montreal. 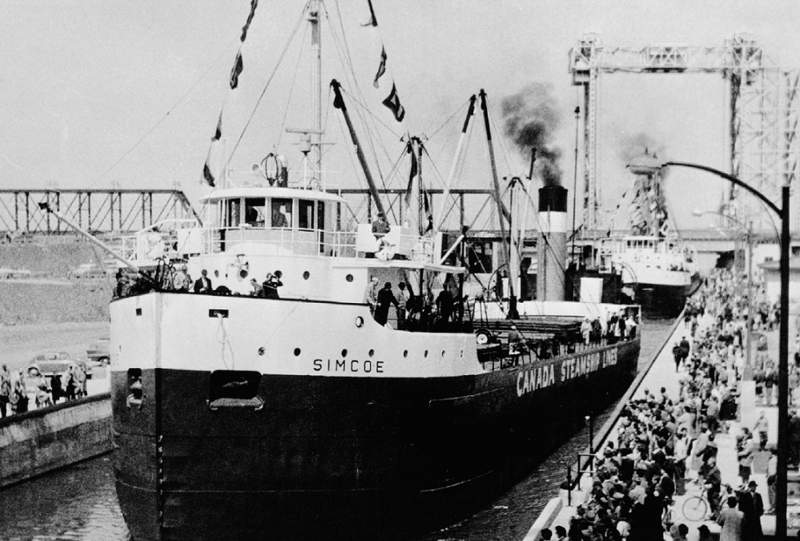 The first real step in creating the modern Seaway came in 1932 with the completion of the fourth Welland Canal. In 1949, Canada and the U.S. signed the Great Lakes-St. Lawrence Deep Waterway Treaty. When that didn’t lead to any immediate action, support for a better marine link than the existing canals grew and the two countries undertook another study by the Deep Waterways Commission. Through the early 1950s some joint projects were carried out to improve shipping through the existing canals. In 1954, Parliament passed the St. Lawrence Seaway Authority Act and the U.S. set up the Seaway Development Corp. Finally, the two countries agreed on building the Seaway at a cost of $470.3 million, of which Canada paid $336.5 million. To build the Seaway, Canada had to expropriate land for the Montreal-Lake Ontario series of locks, which included moving about 6,500 people to new homes in Long Sault, Ingleside and Iroquois. On April 25, 1959, icebreaker D’Iberville began the first through transit of the Seaway. The official opening in June was marked with special celebrations in both countries. For the first 39 years, the Canadian locks were operated by the St. Lawrence Seaway Authority, a division of Transport Canada. Then the St. Lawrence Seaway Management Corp. (SLSMC) was founded under amendments to the Canada Marine Act passed by Parliament in 1998. SLSMC took operational control, while the federal government continues to own the infrastructure and acts as regulator. There are lots of milestones along the way. Of special significance to Canadian shipowners was the removal of a 25 per cent duty on foreign built ships that then Finance Minister Jim Flaherty axed in his 2010 budget. That led to a renewal of the Great Lakes fleet, which can be seen in Algoma’s Equinox and CSL’s Trillium ships as well new vessels operated by Fednav and Canfornav. On its 25th anniversary, President Ronald Reagan declared it The Year of the Seaway and June 27 Seaway Day. In 1986, Congress approved changing the Seaway Development Corp. to an appropriated agency from a self-financing one, which ended its collection of tolls. Canada has invested tens of millions of dollars upgrading the locks, installing new technology like Hands Free Mooring, and implementing other cost-saving technologies. In 2012, SLSMC introduced the use of the Draft Information System, which combines satellite-based location data and highly accurate hydrographic maps to model a ship’s under-keel-clearance in 3D, allowing vessels to safely transit the Seaway with an additional three inches of draft, which allows for up to 400 tonnes of additional cargo to be loaded.